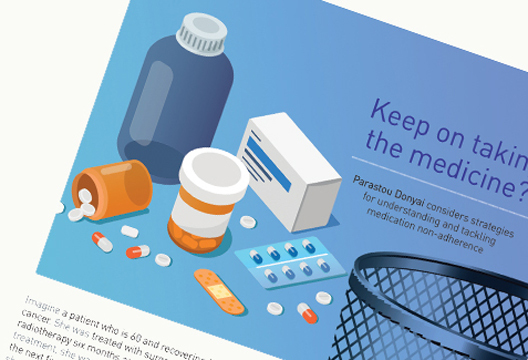 I agree with Professor Donyai (‘Keep on taking the medicine?’, The Psychologist, February 2019) that medication non-adherence is a complex issue. However her article did not consider the relevant theories and research from health psychology and behavioural science that are being used to understand the factors affecting adherence and help us to develop appropriate interventions. Susan Michie and colleagues’ COM-B model, devised from a synthesis of frameworks of behaviour change, describes three factors that determine whether or not a behaviour (i.e. adherence) will be enacted: Capability (the physical and psychological capacity to engage in the behaviour), Opportunity (the environmental and social factors that lie outside of the individual) and Motivation (reflective evaluations and plans and automatic impulses and emotions). A failure in any one of these areas can result in non-adherence, and considering each can help us to understand where barriers lie and then select evidence-based behaviour change techniques using the behaviour change wheel (BCW) to address those barriers. Donyai primarily focuses in her article, as does much of the literature in this area, on factors related to reflective motivation (necessity and concern beliefs about treatment) and psychological capability (knowledge about treatment and ability to plan treatment and avoid forgetting), but does not consider the full range of factors that can affect non-adherence. Recent research has highlighted the importance of habits, an aspect of automatic motivation, in adherence. A 2017 systematic review and meta-analysis by Conn and Ruppar, of the medication adherence outcomes of 771 intervention trials, reported that habit-based adherence interventions were the most effective. Habit-based interventions prompt repetition of treatment-taking in response to a specific, repeatedly encountered, cue (e.g having breakfast). The value of habits is that once they have been formed through consistent repetition of a specific action in a specific context, the initiation of that action shifts from reflective to automatic processes. This means that they require less attention and conscious motivation in order to persist (see Benjamin Gardner’s work: tinyurl.com/yb7gq48p) and are therefore likely to be more resilient. The CFHealthHub project has used the COM-B and BCW approach to explore the full range of barriers and facilitators to nebulised treatment adherence in adults with Cystic Fibrosis and to identify suitable behaviour change techniques to address those capability, opportunity and motivation barriers. These are tailored and personalised to match the needs of an individual, and delivered via a web platform with health professional support. The key aim of this intervention, currently being tested in a randomised controlled trial, is to support participants to develop habits for treatment-taking.